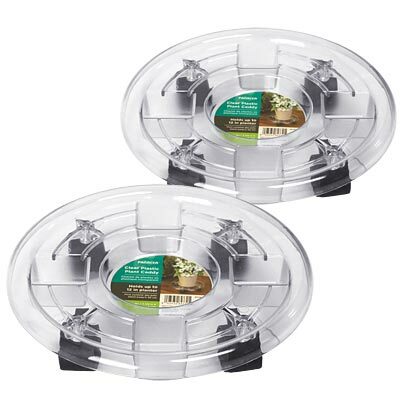 Add a versatile base to two of your potted plants with these Panacea Clear Plastic Plant Caddies. These two caddies are perfect for elevating your pots off of the ground, and casters on each make them simple to move. The clear, plastic body of each accommodates a 12" diameter planter, or ones with a 10" diameter or smaller base, and the curved edge on them adds a gentle hint. Four depressions on the body and one in the center capture overflowing water, and the clear plastic keeps your flowers visible. Each of the four casters on the base lock into position, and the plastic construction lasts for many seasons. Elevate two pots easily with these Clear Plastic Plant Caddies. Note: This case pack includes 2 of the Panacea Plastic Plant Caddies, Clear, 12" dia.